We can deliver DVK-HD® pipe couplings for all common diametres from 60.3 mm to 206.0 mm – anodized version at request. 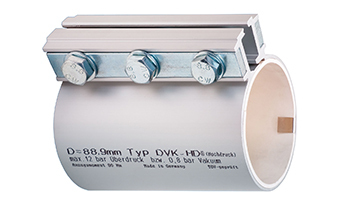 When mounting pipes with our DVK-HD® pipe couplings, it is important to ensure that the pipe coupling is protected against shifting by means of suitable pipe clamps / wall brackets or mounts (made by Hilti or Müpro). 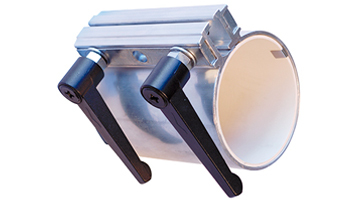 The pipe coupling can seal the pipe up to the specified pressure, but cannot protect it against movement or shifting. 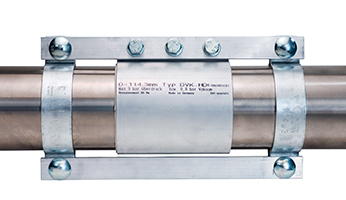 All DVK-HD® couplings are suitable for pneumatic or vacuum transportation (not for liquids!). DVK-HD® couplings are supplied ready for assembly. 1. Mark the clean ends of the pipe at half of the length of the pipe coupling. Make sure that the gasket shafts interlock and do not overlap! 2. Now shift the coupling over the pipe as far as the marking (free of dirt and oil). Then shift the next pipe through the coupling until the two ends abut together. 3. Tighten the screws evenly to 80 Nm. The pipe coupling / gasket will only stand up to the pressure indicated if it is correctly assembled. Tightening torque for all DVK-HD® couplings 80 Nm. 5. We shall be pleased to answer any technical questions you may have.